LeBron James would consider meeting with the Golden State Warriors this offseason when he becomes a free agent, ESPN reported, citing league sources. The Warriors would have to clear max cap space, which would mean losing at least two of their core players, though the report says there is no suggestion they are considering such a move. The report is likely to add fuel to the rumour that James is considering leaving Cleveland. A new and surprising team has been added to LeBron James’ potential destinations this offseason: the Golden State Warriors. Citing league sources, ESPN’s Chris Haynes reported that James would at least consider meeting with the Warriors when he becomes a free agent this offseason. Such a meeting, however, would hinge on whether the Warriors clear max cap space, which would mean breaking up their dominant core. The Warriors are set to have $US128 million in payroll next season, not including any cap holds for free agents or draft picks,according to Basketball-Reference. With the salary cap projected to be about $US100 million, the Warriors would have to clear at least two of their highest-paid players to consider fitting James. Their five highest-paid players, in order, are Stephen Curry, Kevin Durant, Klay Thompson, Draymond Green, and Andre Iguodala. As ESPN noted, if the two sides were indeed interested, a sign-and-trade would perhaps be the best option. Haynes gave the example of the Warriors trading Thompson and Iguodala to the Cleveland Cavaliers in exchange for James. Still, many are sceptical that James would consider meeting with the Warriors, and Haynes says there is no indication that the Warriors even have their eye on James. Instead, the report suggests the intrigue mostly comes from James’ desire to be in a stable, winning culture – something the Cavs, who were 6-8 in January, haven’t exactly exuded this season. 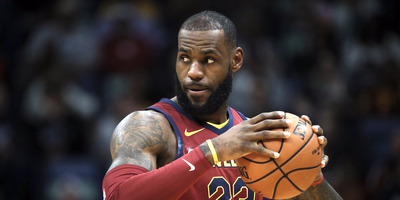 James, who lost his fair share of fans in 2010 when he left the Cavs for the Miami Heat, may also be sensitive to the optics of leaving his home state again to join the most dominant team in the league. If nothing else, the report is likely to add fuel to a rumour surrounding James over the past few months: that he may be on his way out of Cleveland this summer.